"Creatively Made in West Virginia"
A nationally recognized registered brand since 1970, Cabin Creek Quilts’ products portray superb craftsmanship and award-winning designs. We craft bold, original, distinctive, one-of-a-kind creations inspired by traditional quilt designs using vibrant, designer fabrics. Our pieces are functional, well-crafted and durable quilts that are superior to foreign made quilts. Your Cabin Creek Quilts purchase is an investment in an heirloom that actually increases in value, as well as adding warmth and beauty to your home. Cabin Creek Quilts are made in the USA, at home in West Virginia. You're supporting West Virginia quiltmakers who work in their homes, increasing economic development opportunities for them and their families. Let us inspire you with our colorful fabrics and the nostalgia in owning a piece of our mountain culture - creatively made in wild, wonderful West Virginia. Organized in 1970 by VISTA volunteers, Cabin Creek Quilts was a nonprofit self-help quilting cooperative governed by its sewing members and operated by a paid staff. Working in their own homes, West Virginia quiltmakers created high-quality quilts and patchwork products that made their way from the hills and hollows of the Mountain State to fashionable shops on Fifth Avenue in New York and Beverly Hills and landed in numerous notable private collections including The White House. 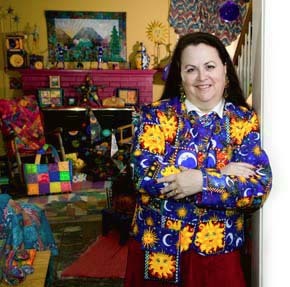 Building on a tradition of superb craftsmanship and one-of-a-kind artisan creations, the members placed Cabin Creek Quilts in the hands of Rebecca Stelling, owner of Mountain Artisans, in July 2007. Read the article by Jay Rockefeller that originally appeared in several West Virginia magazines and newspapers.